Linens Luxury bed linens from the world’s leading designers and weaving mills. Quality home laundry products for care. Blending contemporary and traditional styles with uncompromising value and quality. Peacock Alley Indulging the senses and aiding in one’s desire to express their sense of self within their surroundings. Pine Cone Hill Blending quality fabrics, imaginative designs and charm through unexpected patterns, punch-drunk color, and down-to-earth elegance. Schlossberg Excelling at the creation of exquisite prints. Their print designs are works of art, unlike any other bed linens sold in America, combining up to 14 colors into one outstanding design. Sferra Capturing the timeless beauty of the world’s finest fabrics and embroideries for a lifetime of luxury and comfort. Yves Delorme Renowned French manufacturer of fine linens expressing color, patterns, and textures in an overlapping style. Decorative Pillows from the world’s leading designers and weaving mills. Combines the craftsmanship of traditional French tapestry with contemporary design. Bath Your source for luxury bath towels, rugs, robes & bath accessories! Abyss & Habidecor Giza 70 Egyptian cotton towels & robes - the softest, most absorbent, 700 gram luxury bath items available. Exquisite original embroidered linens with intricate designs and colors works of art! Matouk Giza 70 Egyptian cotton towels & robes - the softest, most absorbent, 700 gram luxury bath items available. Table Fine European linens for formal and informal dining. Grand candles for practical beauty. Sferra Table linens delicately handcrafted to ensure the highest quality. Destined to become a family heirloom. 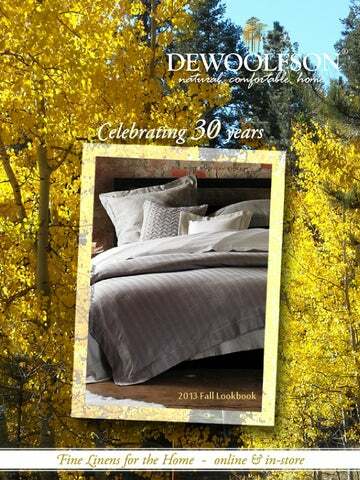 For those with refined taste DeWoolfson®- made, European-inspired down comforters, pillows and featherbeds. Our own silk comforters, pillows and cases are oh-so-special! Our Gift Certificate – the perfect gift for that oh-so-dear, yet hard-to-buy-for person in your life. You decide the amount and we will email them the wonderful news inside our lovely card. Simple and sincere.